Widelands Game - Download and Play Free Version! Design Efficient Roads to Lead the Barbarians, Imperials and Atlanteans to Prosperity! The real-time strategy genre is popular for two very big reasons: it tests your cerebral skills as well as your reflexes. You need to apply strategic thinking in both the short and long term just like in any good strategy game, but you have to think and act fast if you don’t want to get left behind by the opposition. However, compared to the often more methodical turn-based strategy genre, the RTS feels more rigid. Whereas TBS games can involve building expansive civilizations that can succeed through war, diplomacy or trade, RTS games typically only involve war. You build one army, the enemy builds another, and you both fight it out until only one side is left standing. Widelands changes this. Although violence does exist in its world, the emphasis lies on building a thriving society instead. In that vein, you can expect an RTS that approaches the depth of many popular 4X strategy games. 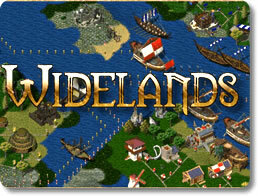 If you’re a veteran to the RTS genre, Widelands should be instantly familiar to you. It has all the usual hallmarks: bountiful lands full of precious resources to exploit, cunning opponents, and strategic depth. Gather resources from the land to aid in production, including lumber, rock, fish and more! Set up dozens of structures, including quarries, shipyards, cattle farms, fortresses, bakeries and more! Features highly detailed and colorful graphics with distinct-looking buildings and characters. Watch your people work like ants! Enjoy a soundtrack of soothing Medieval background music. Few other RTS games offer as much player freedom as Widelands. It accommodates a variety of play styles for players of all stripes. Play as one of three civilizations: Barbarians, Imperials and Atlanteans. All have their own unique strengths, weaknesses, history, appearances and architecture. Deal with neighboring clans in a variety of ways. Learn to trade with them, open up diplomatic relations, or go straight to war. Decide what goods you will produce based on what resources you can accumulate. Adjust the game speed on the fly. Speed it up or slow it to a crawl at any point in time. Play the Campaign mode to experience a story. Set up a custom game on over 30 different maps. Widelands is a game that’s all about player freedom. You are free to develop your civilization however you see fit. You are free to come up with your own unique strategy. You are free to set the rules and conditions for each game you play, and you are free to even create your own maps and mods with the game’s powerful editing tools and open source code. It’s only natural that amidst all of this, Widelands is itself completely free to play. Don’t hesitate; become a pioneer and feel free to set out for new horizons today!